A sewage pumping station, or lift station, from large and small will see everything that finds its way into the collection systems. Rags, plastics, wipes, rocks and wood are all common items encountered in today’s sewage that can cause lift station pump clogs resulting in alarms, overflows and even fines. First flush loading of debris from storm flows or problem dischargers like hospitals, universities and prisons only make the problems worse for pumping station operators. For over 40 years, JWC’s Muffin Monster® and Channel Monster® sewage grinders have been the first choice to protect vital sewage pumping stations. The JWC grinders utilize a low speed and high torque design to shred through the toughest debris while also taking care of other troublesome trash like rags and wipes that find their way to the lift station. 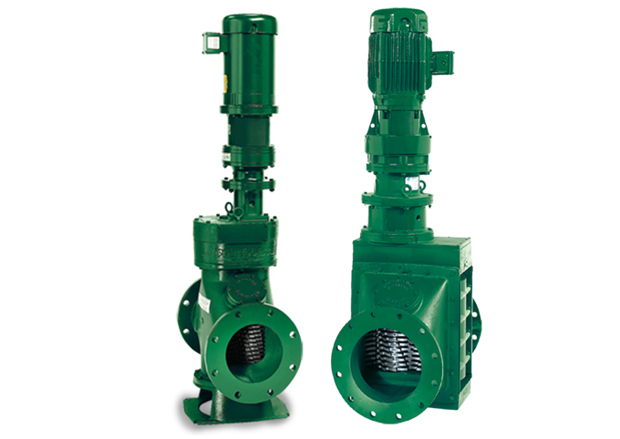 For a sewage pumping station with dry well pumps, Muffin Monster in-line grinders are commonly installed on the suction side of the pumps. The 30K Muffin Monster grinders are equipped for mounting into 4” to 12” (100mm – 300mm) pipelines to grind down debris before they reach the pumps. Pump stations designed with submersible pumps choose JWC’s open-channel Muffin Monsters or Channel Monsters as an excellent solution to protect vulnerable stations within collection systems. These open-channel grinders are installed within stainless steel frames that mount to the wet well wall at the inlet pipe to the pump station. The grinders will shred all debris before it enters the wet-well and insure that everything is small enough to easily flow through pumps without damaging them. Some municipal collection systems operators choose to remove debris at the individual lift station instead of pumping it on to the treatment plant. This is achieved with JWC’s Vertical Auger Monster. This all-in-one system will precondition the solids in the pumping station with a grinder to release the organic materials and then screen out and remove the inorganic debris. The material removed is dewatered and compacted prior to depositing it into a receptacle at the pump station. Today’s sewage has changed over the four decades JWC has been supplying Muffin Monster pump protecting grinders to the wastewater industry. JWC has changed its products, too. To combat the increasing problems caused by today’s disposable wipes, JWC has also introduced its Wipes Ready® Technology for its Muffin Monsters and Channel Monsters. Designed to deal with today’s sewage, the Wipes Ready Technology will shred through wipes and prevent the formation of the rag balls that lead to pump clogs.